Alysa is a conservation biologist specializing in polar bears; she is based out of Yellowknife, Northwest Territories, Canada but spends every fall and part of every summer in Churchill, Manitoba, sometimes called the Polar Bear Capital of the World. 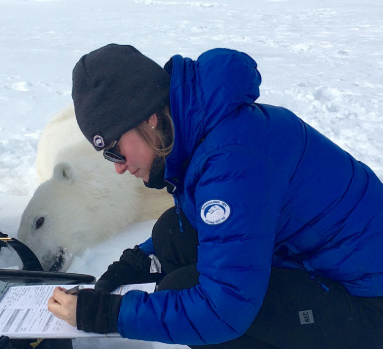 Alysa has been studying Canadian polar bears for seven years, focusing largely on the western Hudson Bay subpopulation, one of the first to show impacts of climate change. She currently works for Polar Bears International, supporting research and directing conservation outreach programs, all with a mission to protect the polar bear and its sea ice home for future generations. Alysa loves speaking to people across the world about polar bears and their unique lifestyle, and is passionate about helping students feel empowered to take action on climate change.